Home » Food n Beverage » GoPro » lucky » lucky draw » Nescafe » Nestle » petrol » Petronas » photo » purchase » spend » WhatsApp » Peraduan NESCAFÉ WhatsApp & Menang Contest: Win Vespa S125 ABS, GoPro Hero 5, Petronas Gift Card! 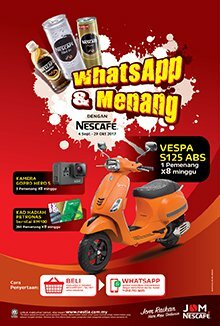 Peraduan NESCAFÉ WhatsApp & Menang Contest: Win Vespa S125 ABS, GoPro Hero 5, Petronas Gift Card! Purchase any two (2) NESCAFÉ UHT / Tin / PET ready-to-drink product in a single receipt within the Contest Period to join this contest. Take a photo of the front page of the purchase receipt, type your full name and MyKad number, then send it via WhatsApp to 018 792 5695. Visit Peraduan NESCAFÉ WhatsApp & Menang contest terms & conditions for more details.